In April 2007 approval was given (Permit 2128) for 72 homes with on site parking and an aggregate area of 8934m/2. 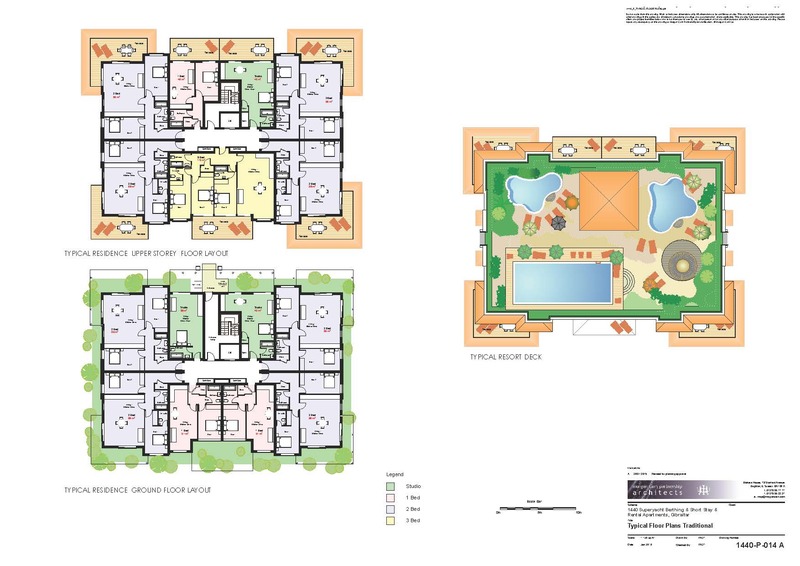 In October 2011 a scheme was approved for 62 apartments, ranging in size from 60 to 300m/2, with a similar overall floor area and, again, with provision for on site parking. The current proposal is for a very similar floor area to those previously approved schemes but there are crucial differences. The access route has been routed away from Marina Bay. 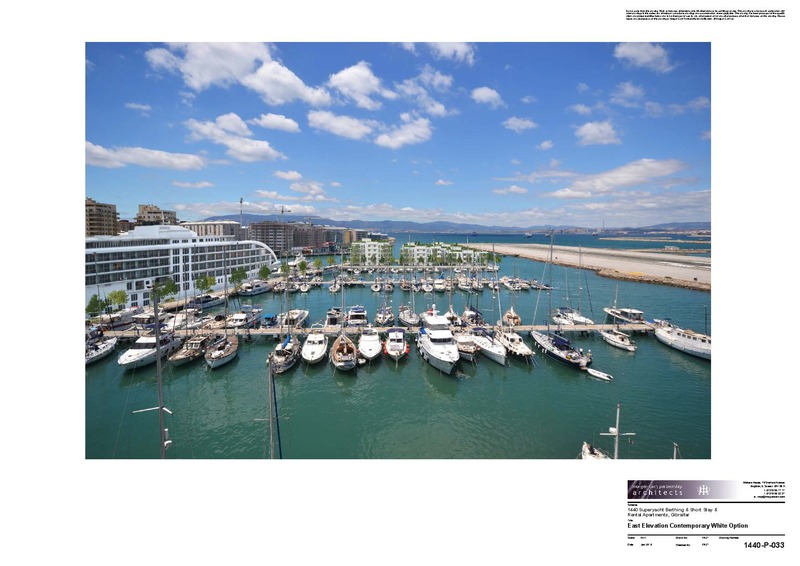 At the heart of this scheme is the provision of Superyacht berths and the potential they represent for the marina and the wider economy of Gibraltar. At present Superyachts generally do not choose Gibraltar as a home port simply because the current facilities are not adequate to their needs. This is a lost opportunity for the local economy. Superyachts are typically valued at £1,000,000 – £2,000,000 per metre and incur running costs equivalent to 10% of their value annually. 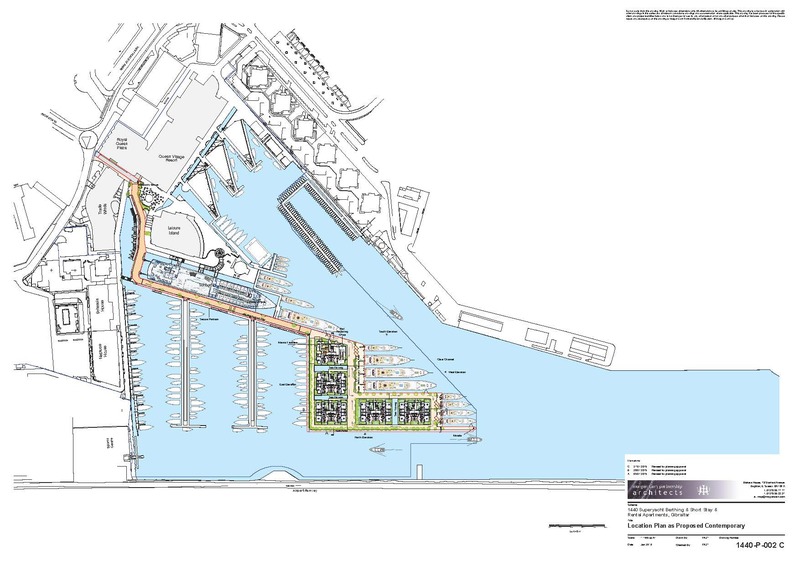 The berthing illustrated in this scheme alone should therefore, if filled, generate potentially £75,000,000 per annum – a good proportion of which would be channeled straight into the local economy (94% according to Superyacht Magazine (based on survey data) 6% is derived by the Marina in berthing fees. Premier standard showers and bathing facilities, WC facilities and laundry. 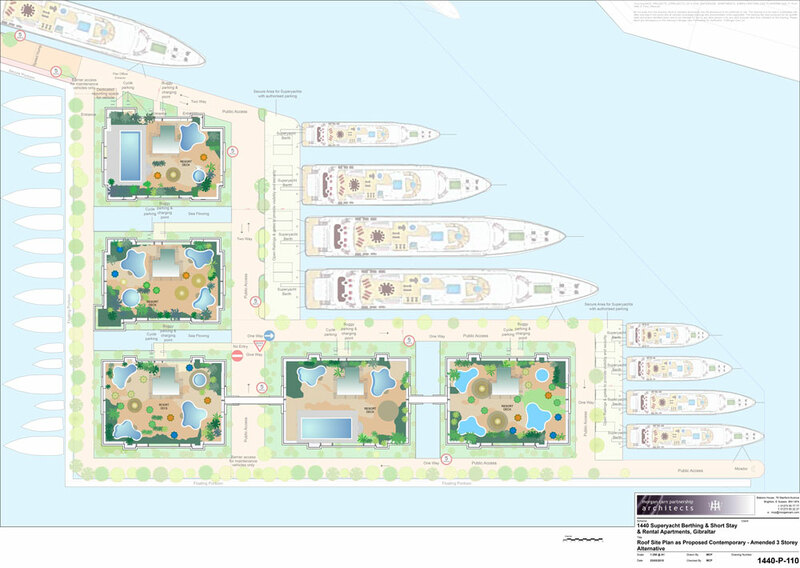 The funding of Superyacht berths needs subsidy and hence the shortage of such berths throughout the Mediterranean. The short stay and rental waterside apartments are complementary to the scheme insofar as they will subsidise the improvements necessary to attract the Superyachts. 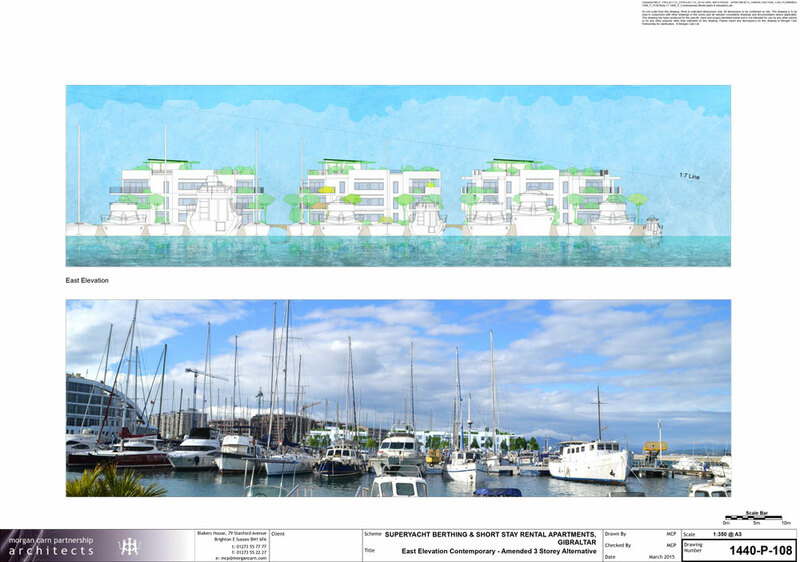 They are focused particularly on the needs of marina users and visitors addressing a local need for short stay and rental accommodation. In terms of Planning Permission user clause they are not for single owner occupation. The apartments have been designed as discrete units with gaps and flowing water in between. 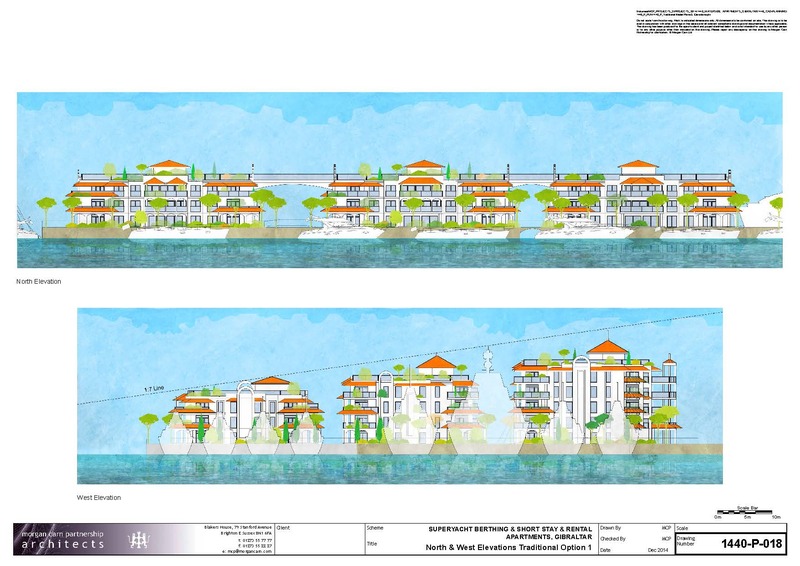 There are 3 no 3 storey, 1 no 4 storey and 1 no 5 storey units with trees planted at approximately 5 metre intervals along the access ways. 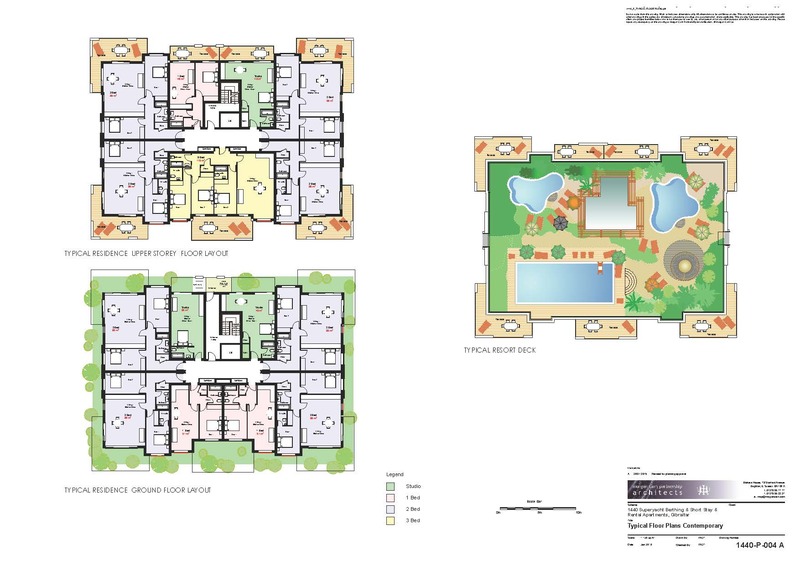 In total there are 126 apartments – please refer to the attached schedule for the individual break down. 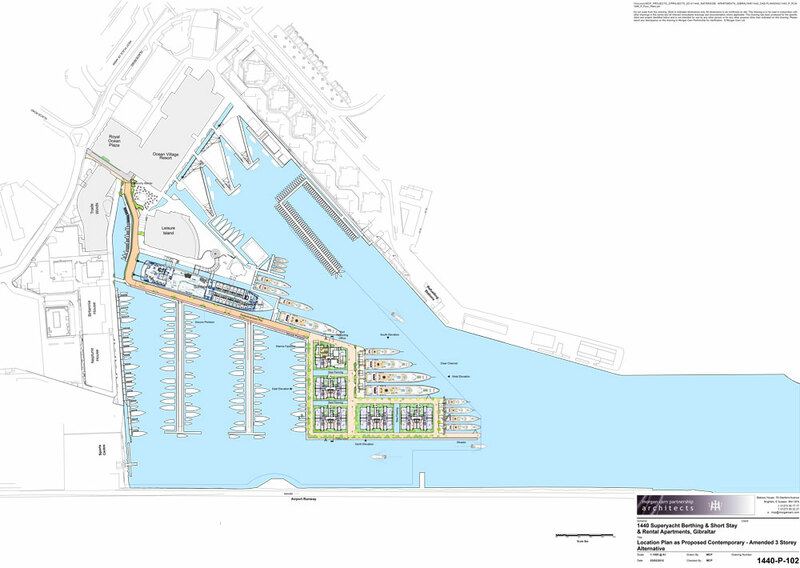 The total area is 9669m/2 including the new marina facilities. 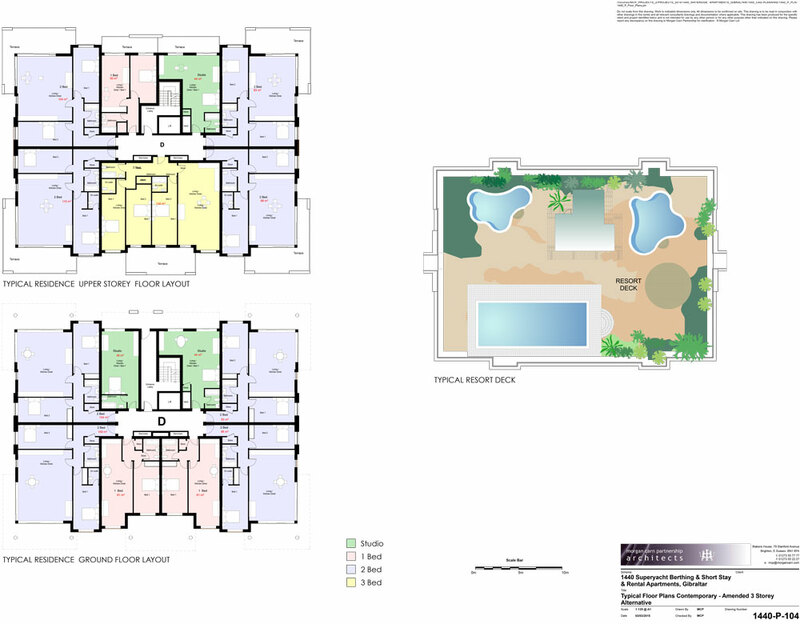 Our intention has been to create an architecture that blends, complements and is in scale with it’s environment. We are presenting two alternative designs for consideration. 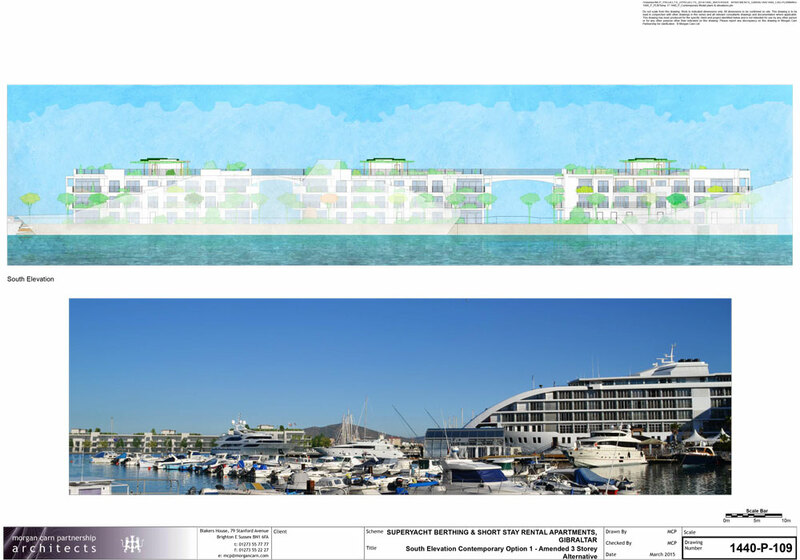 The first design has a contemporary aesthetic close in spirit to Ocean Village. 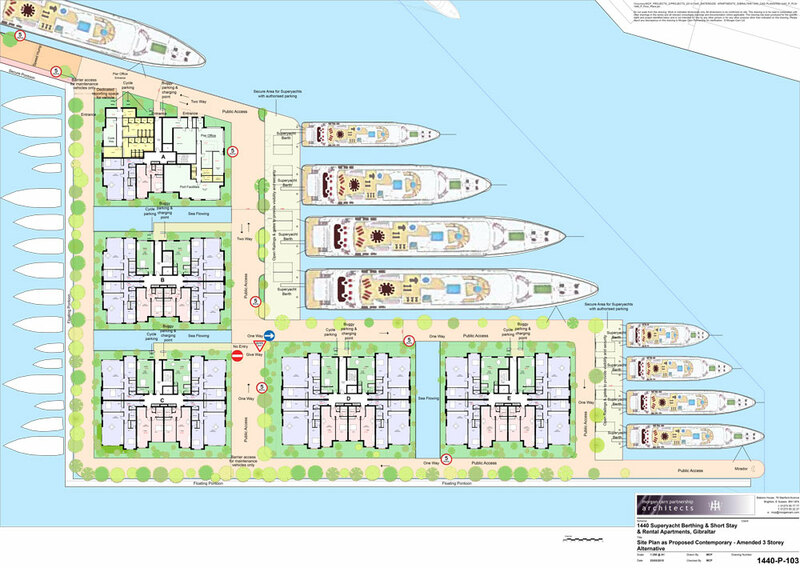 The second is in a more traditional style which more closely resembles the existing style of Marina Bay. Both schemes have been illustrated with different colour variations for the Commission to compare and choose. We have aimed to retain the maximum area of water within the scheme. The extent of water this scheme encloses is less than in previous applications. 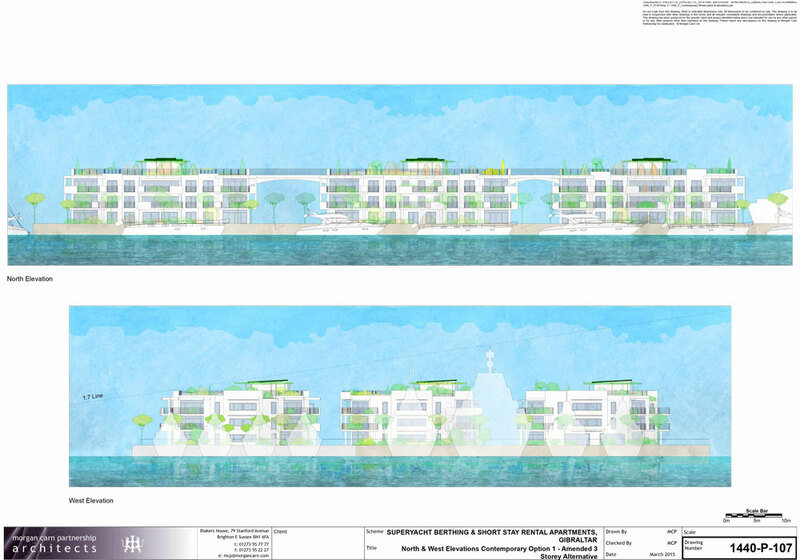 To achieve this the recreational amenity areas have been located on the green roofs of the units. These green roofs will be provided with pools and play areas and intensive landscaping in the manner that has proved successful and popular in Ocean Village. They will also incorporate PV/solar thermal panels to as a renewable energy source. 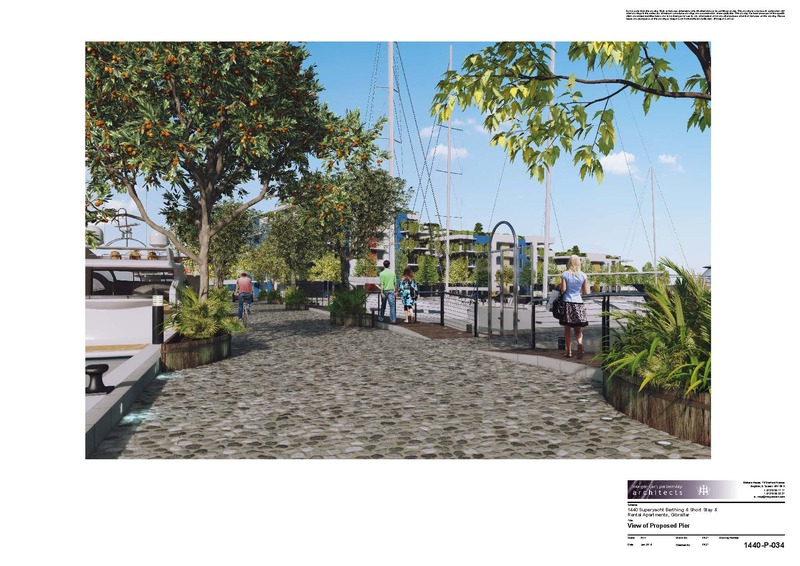 At deck level and all along the pier there will be extensive planting of trees and shrubs which will be illuminated at night with low energy atmospheric LED lights. 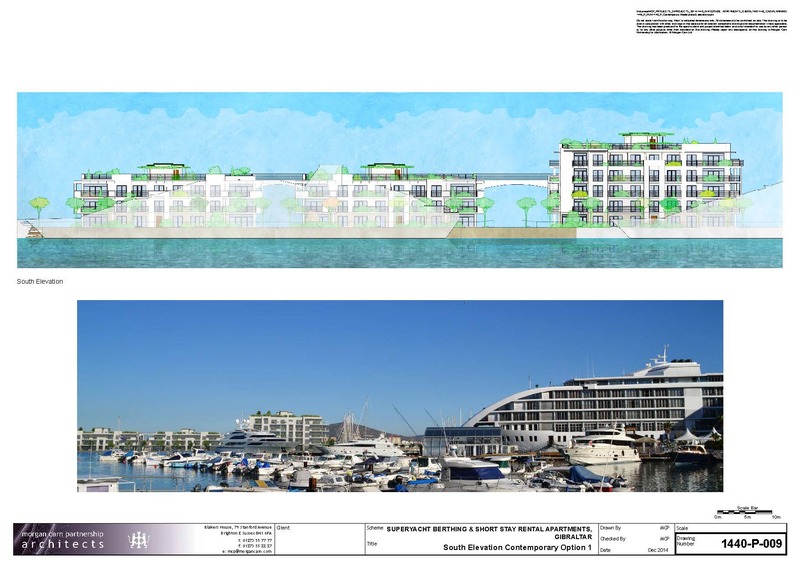 In combination the apartments and the landscaping and Superyachts viewed from the Marina Bay quayside will help to obscure the industrial installations on the Western side of Algeciras Bay and the visual blight of the flaring associated with them. As part of the advance consultation process the proposal has been discussed with the RAF and Civil Aviation Authority. It will be designed to fully comply with the requirements of the obstacle limitation surface and other requirements of the MOD. 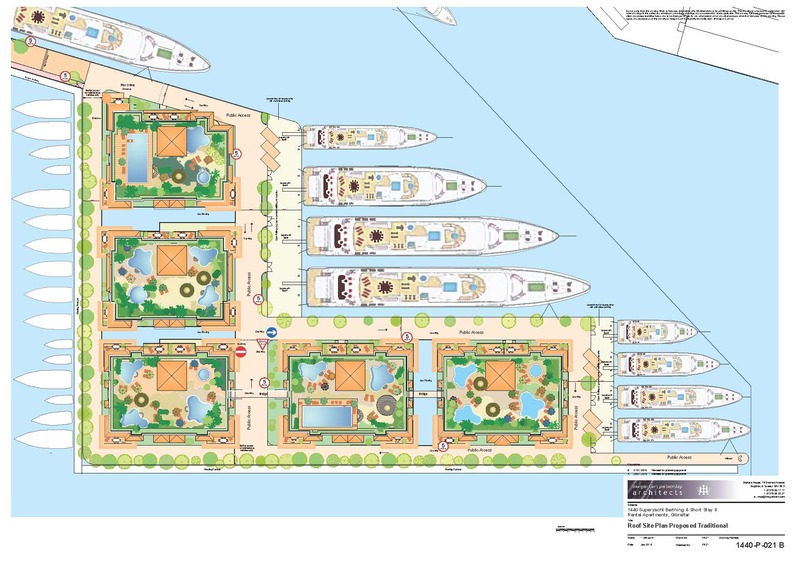 Access to the Superyachts and apartments and public pedestrian access will be via the existing pier which will be enhanced, widened and beautified. The DPC previously expressed a wish that vehicle access should be restricted and this point has been conceded in these proposals. 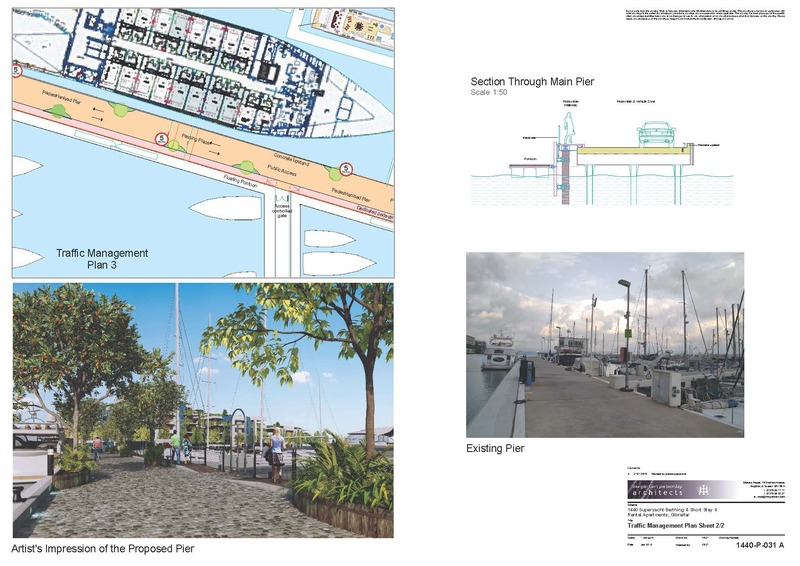 The pier is designed therefore as a pedestrian zone. A limited number of vehicle movements will be permitted for the purposes of supply and delivery to the Superyachts and homes and emergency vehicle access. This approach is typical of the pedestrianised streets common to most major towns and cities where a certain amount of vehicle movements are permitted for the limited purposes of access and supply and emergency vehicle access but where the overwhelming priority is for pedestrian and cycle access. With appropriate safeguards in place these environments have proved perfectly safe. Vehicle speed on the pier will be limited to 5mph. The speed will be naturally controlled by forming landscaped beds that will function as chicanes reducing the road width at critical points to calm any traffic. Three passing places have been provided. 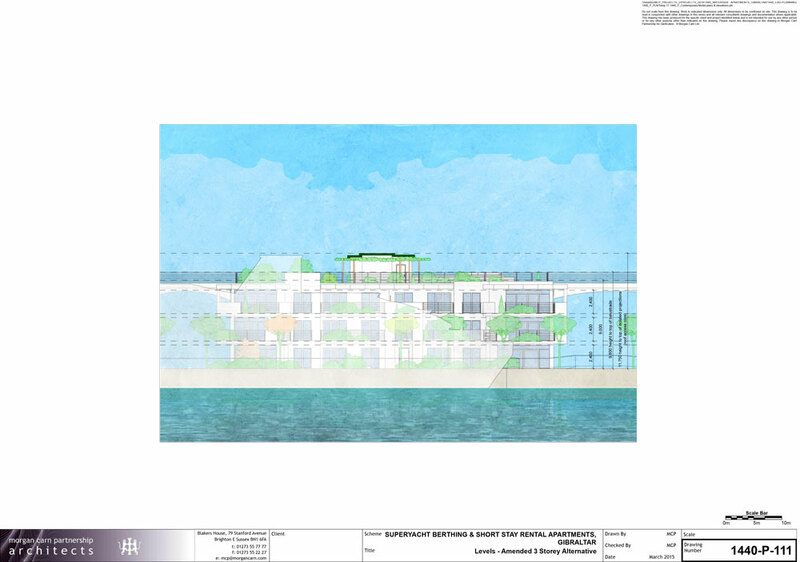 There has been vehicle access on the pier since Marina Bay was built so this is not a new development. A speed limit of 5mph is in place and there is existing signage to that effect. This route has been used successfully for delivery and access since the mid 1980s. There is no on-site parking designed in for the apartments in this scheme. 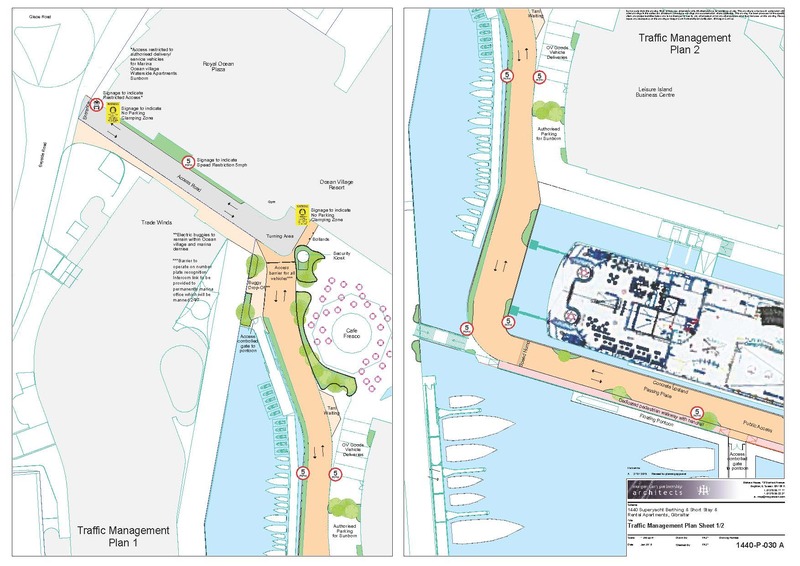 Forty spaces will be provided in a major new car park being developed on the former site of the Med Rowing Club. 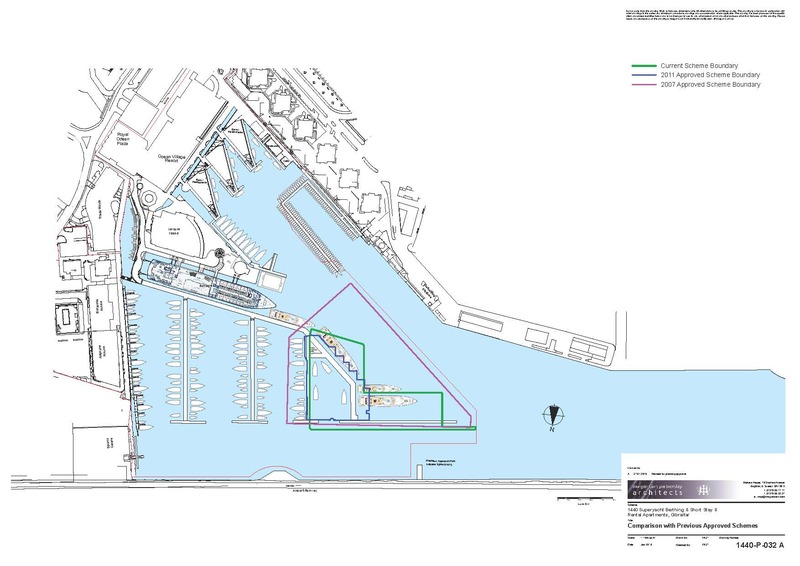 Adopting a previous suggestion from the Commission there will be the facility for electric buggies – parking and charging points are shown on the Site Plan. Cycle parking and cycle hire will also be available on site. The buggy and cycle hire will be managed from the office within the ground floor of Unit A. 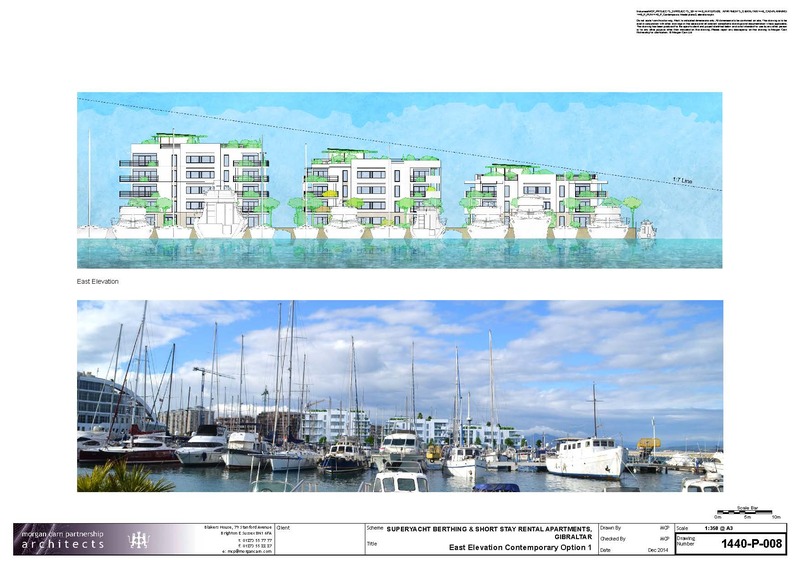 This office, which will look after the marina facilities (WCs, showers, laundry etc) and provide security for the site, will be manned 24/7 as is currently the case. 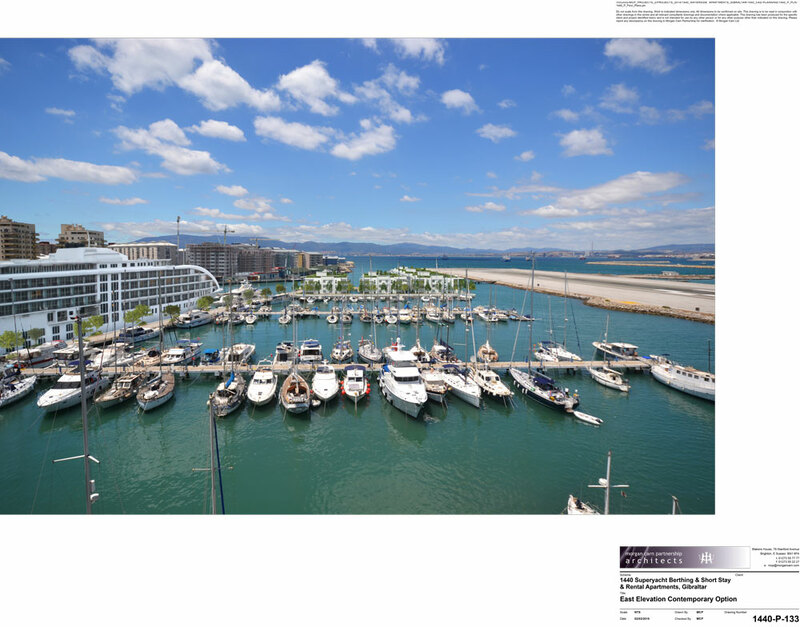 Marinas especially marinas with the draw of Superyachts are naturally attractive destinations for the public – to walk, to soak up the atmosphere and to admire the boats. 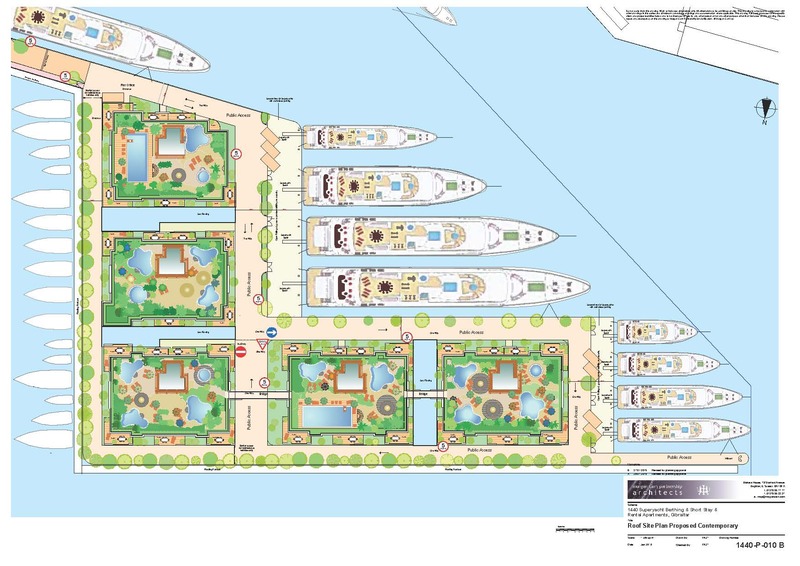 Our intention is to encourage public access and to consider the recreational aspect as a public amenity. 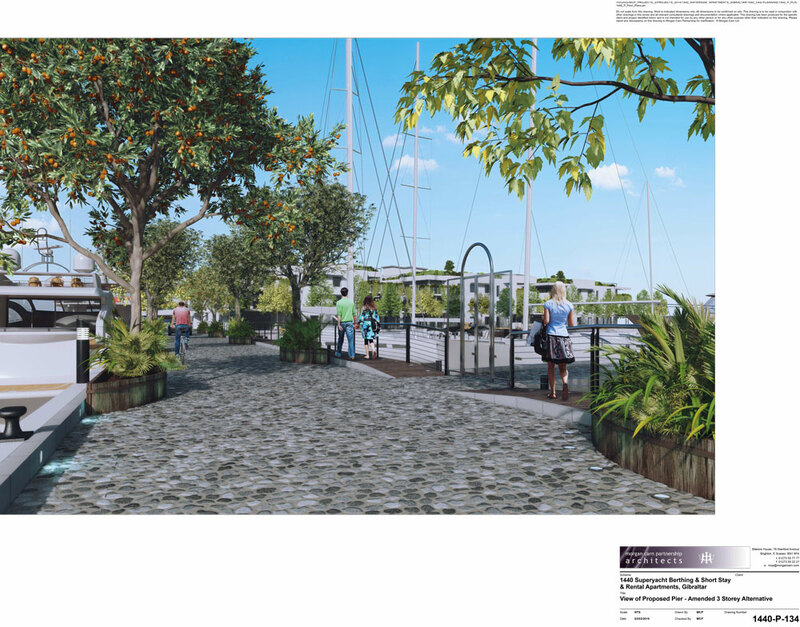 The piers will be extensively beautified with trees, flowering shrubs and subtle lighting. The intention is to provide a pleasant environment for promenading. At the farthest Western point of the pier we include a mirador with seating and views across the bay and runway. 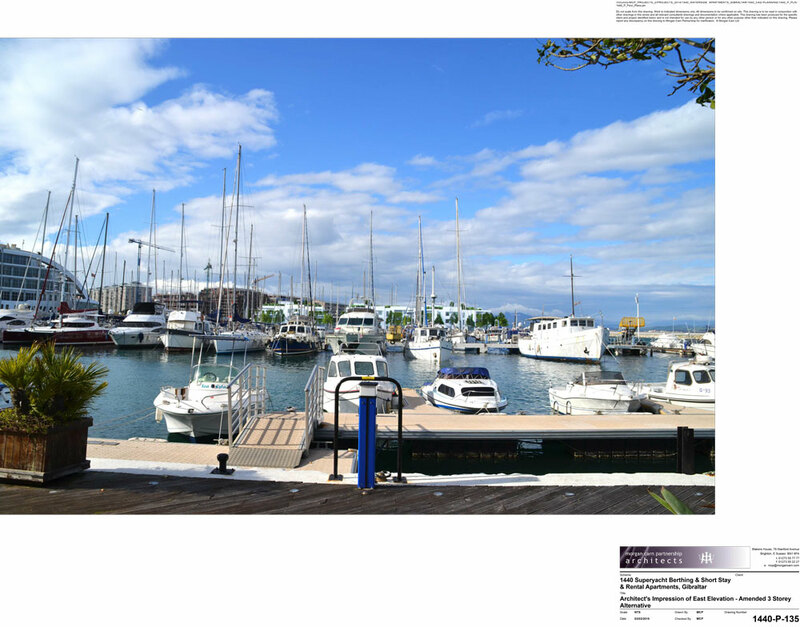 Boat owners require a level of security and the scheme seeks to achieve a balance between free public access and enjoyment of the marina environment (in which Superyachts are of course one of the major attractions) and the needs of security. 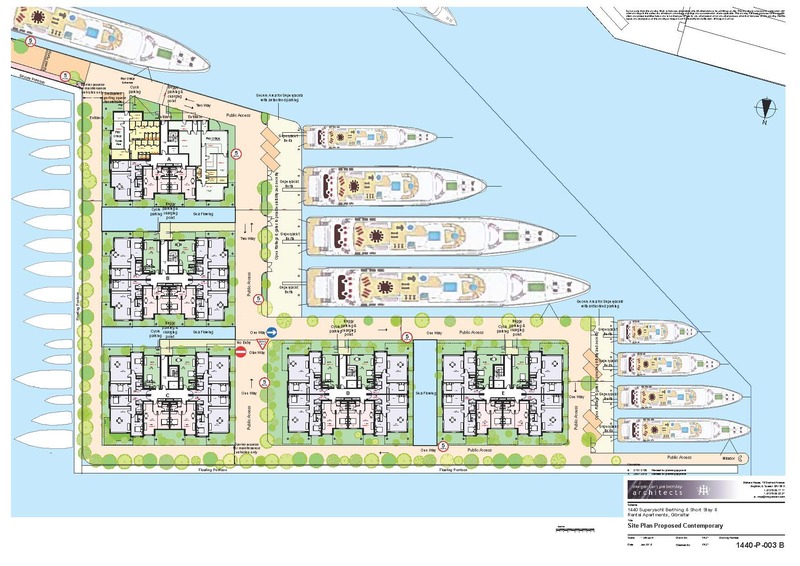 There will be a secure gated area for the Superyacht berths formed with open iron work that will allow visibility but ensure security for the yachts. 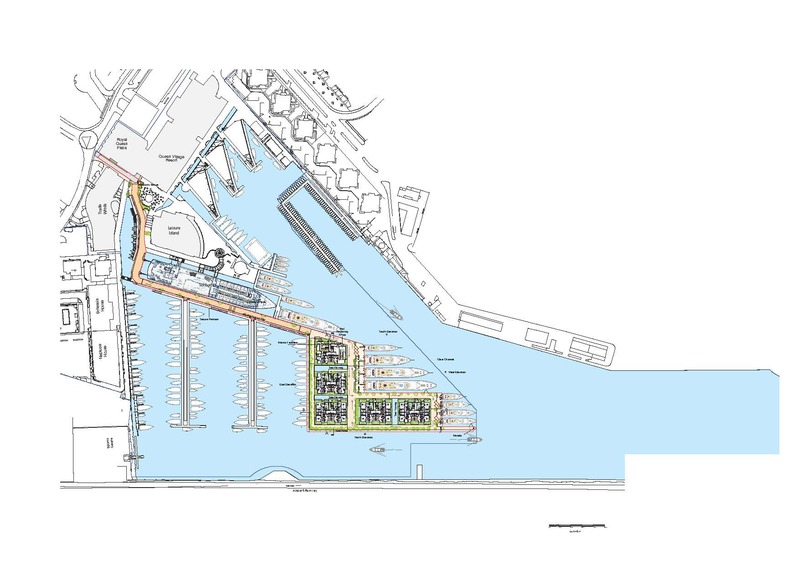 Smaller boats berthed around the branch piers off the main pier will be accessed from floating pontoons with gated access. 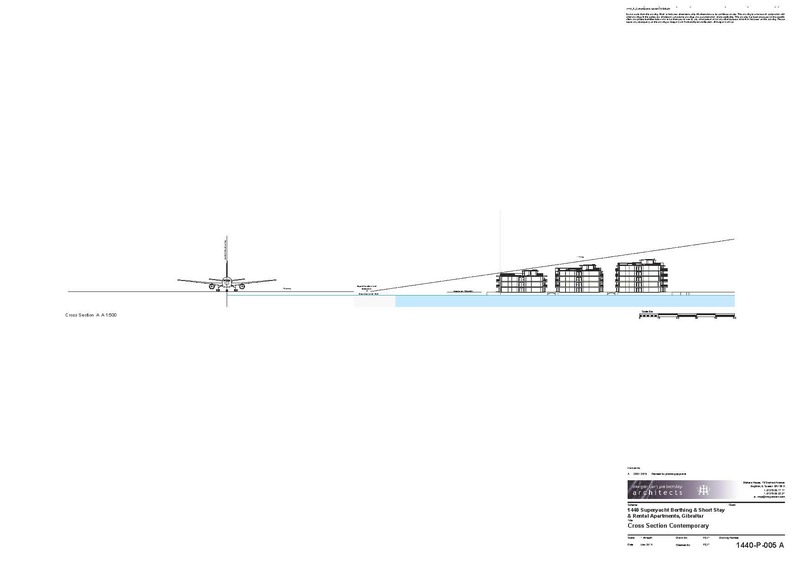 CGIs of the proposal from Marina Bay quayside and Watergardens have been included to show the proposal in it’s context.